As I often cite, KDKA-AM began broadcasting in 1920. But long before KDKA, there was radio. It is the radiomen before KDKA that are often ignored, and whose histories are lacking in detail. "In 1911 in New York City, Dr. Elman B. Myers started broadcasting a daily 18-hour program which was almost all records. His wife, Sybil True, the world's first recorded female DJ, went on air in 1914 with a show she called "The Little Ham Program." She borrowed records from a local music store and concentrated on young people's music in an attempt to encourage youthful interest in the possibilities of radio. Even at this early stage, it was clear that it was a powerful force. Mrs. True noted with satisfaction that her program had a noticeable effect on the store's record sales. "These young operators would run down the next day to be sure to buy the one they heard on the radio the night before." In the late 1920s and 1930s, Dr. Myers was an employee of the Radio Audion Company in Jersey City. He lived in Belleville, NJ. What few pieces of his work were formally patented and credited were later assigned to Radio Audion. Patent 1578462 was a hand tool to twist wires for the support of electrodes. He's listed as living in Wayne PA in September 1921. U.S. Patent 1571490 was a cheap amplifier coil. It's not the first or only amplifier coil, it was just a simple coil meant to be replaced modularly. But now it's December 1921 and he's listed in Belleville. So now we know he relocated in the fall of that year. September 1928 he lists his hometown as Norristown, PA; which is close to Wayne. He's assigning 10% to a Howard Dix in NYC, probably his patent lawyer. He's moved back home. That's on a strange patent 1774609 which somehow relates to mayonnaise. In 1937 he's still in Norristown, now patenting a small improvement on a rotary grinder. He went on to much success in aeronautics. And very late in his career, in the 1960s when he must have been in his 80s, he made some very interesting developments with a mercury lamp that allowed data to be transmitted through light. They did a test broadcast in 1963. The July 1925 issue of Radio News tells us that Dr. Myers invented the "the Thermion Vacuumless Tube." It was a prototype that enclosed the filament body in an isolantite tubular container. The filament was mounted on screw terminals so you could affix a new one when the old expired. It was a nifty idea. Instead of continually making new tubes, you coudl refurbish them. (Isolantite was developed in the 1940s for use in spark transmitters.) I cant' find a patent for this puppy. I am Dr. Myers's (check your spelling) son. 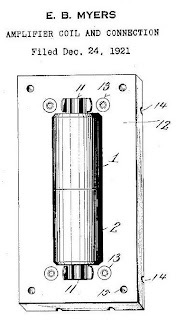 Among his accomplishments were the co-invention of the Audion Tube with Dr. Lee DeForest; sole inventor of the Peanut Tube (accredited and displayed in the Smithsonian); construction of the first radio tower, built in 1911 in Albany, New York; inventor of the RAM jet (named after my Grandfather, Richard Alexander Myers, and the list goes on. If you would care for more detailed information on his career, contact me and I will provide the details. Wonderful. Sorry about the spelling, (now corrected) I used sources that disagreed and should have gone with his own signature on that patent. I'd be thrilled to post any information you have. Dr. Elman Myers also did work on a television receiving tube called the "cold light" tube. This was demonstrated at least once, at Myers' laboratory in the Chrysler Building, NYC. The occasion was a broadcast from CBS' TV experiment station in 1932. Talent provided by the Democratic National Committee made it the first political campaign telecast. That one is totally news to me. Do you have a link?